As shown in this layout, paper tearing is a great way to create a soft edge on your page and draw the different elements of your page together. 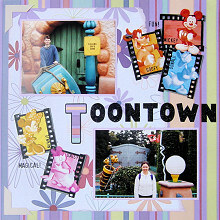 This layout was created using Imagination Project West Thames Street and South End Avenue paper, light purple cardstock, tan cardstock, black cardstock, light purple ink, black alphabet stickers and Sandylion Mickey & Friends Filmstrips stickers. Use the Imagination Project West Thames Street paper for the background. Before you cover it with anything, cut out the first letter of your title from the middle (in this case, the letter T). Make sure the stripes on your letter are horizontal and the area of the paper you take it from will be covered up later. Cut a piece of South End Avenue paper approximately 25cm wide by 28cm tall. Tear down the right edge, as shown in the layout above. Ink the edges with a light purple ink and when dry, adhere to your page approximately 1.5cm from the left edge. Mat your photos with light purple cardstock. Adhere to your page as shown in the layout above, leaving enough space between the photos for your title. Mat the first letter of your title with black cardstock. Adhere under your first photo. Finish off your title with black alphabet stickers. Select the Sandylion Mickey & Friends Filmstrips stickers that you would like to use. Arrange three in the top right section of your page so that they overlap with each other and two in the bottom left section of your page. Add phrase stickers too if you like. Finish off by cutting two large corners from tan cardstock and adhering them to the top left and bottom left corner of the South End Avenue paper.